Obamanomics: Why Did the ‘Stimulus’ Fail to Help the US Economy? The stimulus has not staved off a major depression; instead, it has ensured the greater likelihood of a major economic collapse. When Congress was debating President Obama’s proposed “stimulus” last year, two of the watchwords for the near-trillion-dollar boondoggle were “jobs” and “shovel-ready.” Now, given what comes out of Washington, one needs a shovel to clean up the muck, and I appreciate the politicians and the media telling us we needed to have our shovels ready. Therefore if government is to prevent the recession-causing “glut,” it must spend whatever is necessary to cover any “shortfall” in private consumption and investment spending. Out of this “theory” we get the present “stimulus,” complete with the blessing of Ivy League economists (who seem to perform the role of the High Priests in today’s political economy). Such a “theory,” however, is doomed to fail every time, and I wish to give some reasons why. The economy is not a blob into which one stirs in money the way one stirs in an ingredient into a cake. In other words, the economy does not have a “just add money” in a recipe. It is driven by people making purposeful decisions. An economy has a structure of production that when working well directs resources, labor, and capital toward those areas of production that reflect the desires and needs of consumers. When governments expand money through the central bank, the rush of new money distorts the production structure and changes the relative value of assets and factors of production. In the early stages of this government-inspired boom, the malinvested assets (the ones that become more valuable as a result of the artificial boom itself) expand relative to other assets. The credit-fed boom ultimately cannot be sustained, and it becomes painfully clear that malinvested assets (see the housing-real estate bubble) quickly lose their value relative to other assets. This is the beginning of the recession, which is a period in which the economy begins to reassert the “consumer-preferred” value of economic assets. Attempts to “stimulate” the economy through massive government spending may put money into the pockets of politically connected people, but it does nothing to restore the economic factors to their proper balances. 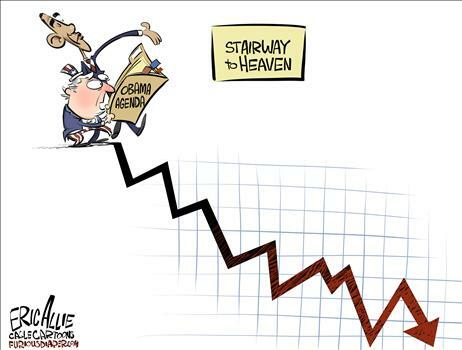 Instead, the “stimulus” only serves to further distort the economic fundamentals and prolong the downturn. That’s right. The stimulus has not staved off a major depression; instead, it has ensured the greater likelihood of a major economic collapse by keeping the factors unbalanced and distorting the structure of production. The fact that the “elite” economists ignore (or even mock) what is known as the Austrian Theory of the Business Cycle does not change the fact that it explains why the Keynesian “solutions” are making things worse. Government can no more end a recession by pouring new money into the economy than one can end a fire by pouring on gasoline. But it can burn down our economic house.